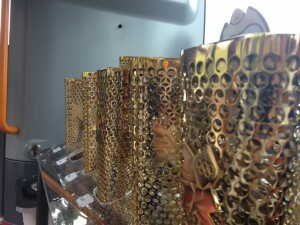 I thought I would write a blog on my recent experience carrying the Olympic torch. Mainly because the whole thing doesn’t really seem real and I thought that by writing it down it may sink in a bit! I may have got carried away with the text, so have included some pictures I took while on the bus and from other people. So here is a not so brief overview of my moment with the Olympic flame. The day started at 11.15 where we had to meet at Foxwood school. 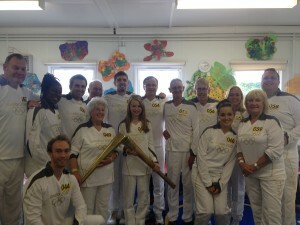 This is where all the torch bearers for Hythe and Sandgate met. 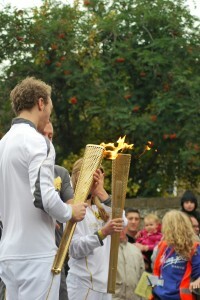 We were introduced to each other, given a briefing on how to handle the torch, how to pass it on (the kiss) and what to do after the event. I was generally quite nervous at this point, but reassured that I was not the only one feeling that way. At 12.45 we went onto the bus and set off for the first stop. This was my stop! While waiting for the flame to arrive from Ashford we all took a minute explaining why we had been chosen to carry the torch. There were some really amazing stories, not least the bus driver who was involved in the event because he helped a number of panicking passengers on his bus after someone tragically threw themselves in front of the moving vehicle. This whole moment was filled with excitement, anticipation and elements of guilt. Guilt, because I kept on thinking why me, and that there are other people out there who could have been chosen. Again, I was reassured after speaking to the others who felt the same! Then, suddenly the general volume increased as the flame approached. 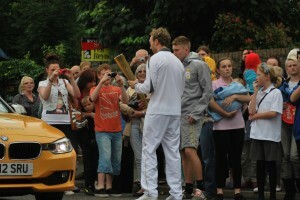 I was told to get out of the bus and given my torch to hold while I waited for the flame to arrive in the cauldron. I am not 100% sure how long I was waiting there on my own, but it felt like an age. In that period of time a number of sponsorship buses went past shouting out my name to the crowd which by this stage had surrounded me with cameras. I felt like an American presidential candidate as people posed for pictures with me, held their babies next to me for a photo, ushered me to sick relatives in order to pose for pictures. This moment was bizarre. I didn’t really know what to do or think! I did feel a bit emotional at this point as the gravity of the situation seemed to overwhelm me for a second. 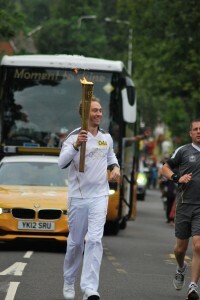 Finally, at 1.06 the flame arrived with the Met police who run along side keeping the torch safe. They brought out the cauldron, turned on the gas in the torch I was holding and lit it. As soon as it was lit we were off! A gentle jog down the road, where loads of friends family and the SGM team, various clients and the public were watching and cheering. This was the best bit! It was so exciting and an extremely proud moment for me. The crowd really got behind it and I really believe it helped bring the community together and build the excitement for the Olympics. I rounded the corner onto Military road and passed the flame on to the next torch bearer who set off for her leg of the run. 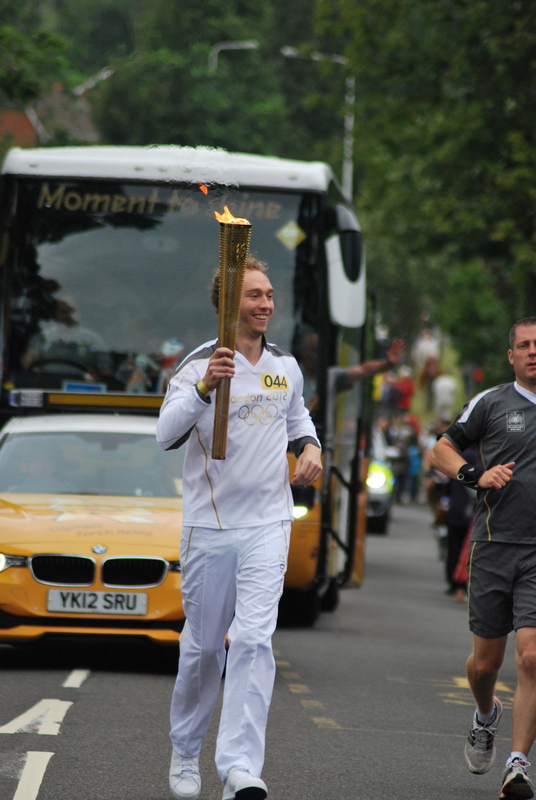 I then went to the bus that was following up behind, to be joined soon by each of the torch bearers after they had run with the flame for a bit. The atmosphere on the bus after each of us had held the flame was great. Everyone was pretty much lost for words about the experience. 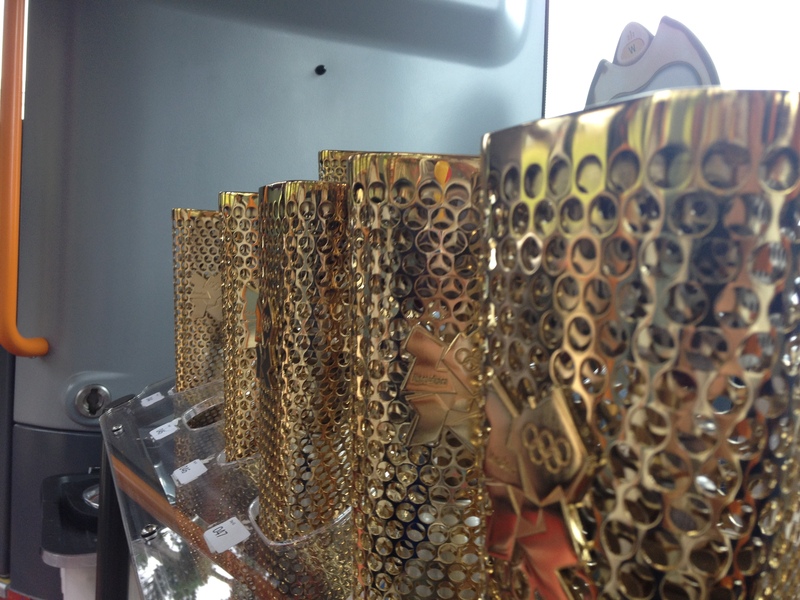 The bus returned to the pick up point and the Olympic organisers decommissioned the torches. These were then handed back to us before we left. We each said our goodbyes and naturally I headed off to the pub. 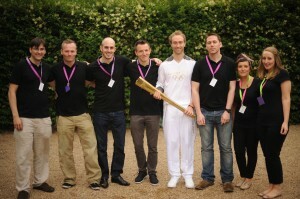 Back at the Bell in Hythe at around 2.30 I met up with the team, friends, family and news crew! We cracked open some champagne, recorded a few bits for ITV and generally chatted away. All in all one of the most amazing days of my life and something I will never forget. I feel totally privileged to have carried the torch, and extremely proud to have been a part of the build up to the Olympics. Then… I was off to get married in Germany! All in a weeks work.